We're getting ready to start on the basement soon. I know, its been a while since I first mentioned the basement reno... but these things take time... not to mention it takes a really long time for me and HandyMan to decide on a layout... and we're still tweaking it. So here is where we're at. Its a bit different from the last layout options I showed you. The upper part of the plan hasn't changed much from what we have existing. The bathroom footprint stays the same but we will be redoing all the finishes - tile, flooring, fixtures, paint. The large laundry room will now essentially be made into two rooms - (1) an unfinished storage area, and (2) a smaller but more functional laundry room with wall to wall cabinetry and lots of counterspace. The lower part of the plan is where all the fun stuff happens. We're taking out the wall that separates the craft area and the entertainment area to create one big space. In the craft area, I'm envisioning a few floor to ceiling pantries and a long countertop. One of the "tweaks" we still have to decide is where to put the workstation. We may put it in the bottom left corner, have the countertop drop to desk height, wrap the corner, and then drop again down to banquette height. The banquette across the whole southern wall is my new favourite feature of the room. I really wanted a craft table, but with four chairs, plus the workstation plus Chloe's play area all in the same vicinity, space was getting really tight. So, we've incorporated a long banquette - the banquette adds storage, does double duty providing seating around the craft table, and gives Chloe a great place to lie down and read a book. The craft table will also be on casters so it can be moved out of the way as needed, further opening up the space. I think space planning is the hardest thing to get right. The basement isn't a huge space so to fit in all of our "must haves" was a challenge. I wish Chloe's play area could be larger, but then that would leave no dedicated space for crafts. And I'm thinking as she gets older, we'll want more room for painting and craftmaking and sewing, right? Tell me the truth moms. 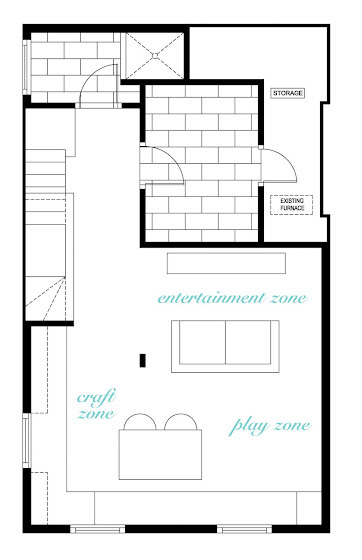 More room for dress up and play kitchen and toys - or more room for drawing and creating? So this is the "dream plan". We still have to price out all that cabinetry for the craft area... and it doesn't help that I fell in love all over again with the Martha Stewart cabinets when I saw them at my local Home Depot... so who knows, my plans for 10 long narrow stacked drawers to store fabrics and paint pots and wrapping paper and a 10' long banquette may turn to dust when we realize all we can afford is a 2' long bench and a pot drawer! That's going to work great for you, I think. I love the cabinets too! your space allocation really depends on your kid. my daughter is nearly six and she LOVES crafts ... the more space for glue and glitter and paint and beads, etc., the better! pretend play and dress-up are merely afterthoughts, only when a friend is over who likes that sort of thing. your daughter is still young, so it might be hard to know what will appeal to her more. flexibility is key. can't wait to follow the basement reno! 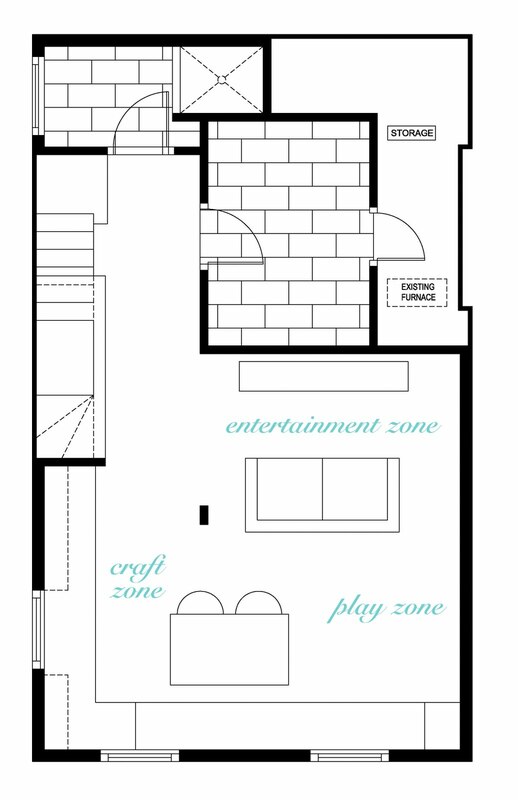 What software did you use to create your floor plan? Hard floors in a crafty area may be easier to clean - glue and glitter and paint don't always play nice with carpet. And if you drop pins on carpet you always miss picking up one - and you'll find it when you are in bare feet. What will the workstation be home to? Computer & printer? Laptop? Will it be your main computer area of the house? You could make several areas on that west wall suitable for "desk" work by using several storage piers (12 or 18" wide cabinets) to support the counter rather than continuous cabinets. Then you could keep the entire counter one height. You will probably want holes in the counter in several places if your outlets are below counter height - or outlets placed above counter height. Then you are prepared for sewing machine, rock tumbler, glue gun, soldering iron or whatever else catches your fancy. Table on casters and the banquette are both brilliant ideas for this space. Just make sure the casters lock so you can keep the table in one place when you need to! And drawers rather than lift up lids will make the banquette storage easier to use. You are probably fine on the crafty & play area division as you are making them connected but flexible by using the table on casters. Sorry for the long, rambling comment - but I just had a bunch of oddball thoughts when I looked at the plan. Can't wait to see what you do. Instead of a rolling table, why not a flip-out one from the counter? I've seen Kitchen tables fold open... Rig something to pull out and flip open into large table from the counter, with support that swings out underneath. Think hidden ironing-board or Murphy-Bed type concept. When folded, it should be flush with the existing counter. Hence, freeing up floor space when not in use. And, be large enough to properly "cut" and sew on. A little "origami" carpentry.. it CAN be done! Arts and crafts win over more dress-up. Not only great for arts and crafts, but also for school projects that will invariably come. Speaking from experience as a mom of 4. Love the idea of a movable table. Love Auntie Shan's folding table idea also, but I think a table you can move all around the perimeter as you need to for cutting out patterns, school projects, etc might be better. Love the 'more open concept' of you space plan. I love the storage room tucked behind the laundry room! Maybe only do the one wall with stairs, and not the full turn? Can't wait to see the project come alive! I don't really know what to advise, except to think long term. Will she practice an instrument down there? Carpet. Will she have sleepovers with a gaggle of girls down there? Carpet. Will she want to rollerskate down there? Concrete. (Ha ha-- whoops, that was my fantasy as a kiddo, to have a concrete basement where I could skate to my heart's content.) All in all, it looks wonderful and multi-functional already, so I guess just be flexible with the permanent stuff. My advice is to give as much space and storage as possible for the kids stuff because that is what will take over your space if it isn't well organized...storage storage storage. If their space is large and well planned, than the room you have will be enjoyed:) Very exciting and can't wait to see it all come together! Great blog! I just stumbled across it today. We're planning a basement redo too, same boat! Like I said before I love it! I think crafts trumps the kids toys because the kids will be using the craft space too. And with a wheeled table you can always make more space.